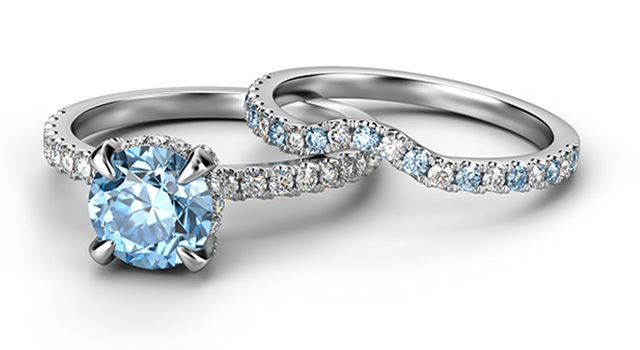 Gemvara is all about letting you create and customize your dream piece. One of the most personal purchases you’ll ever make is when buying an engagement ring, and there’s plenty to consider when choosing your ring: It starts with selecting the right stone or stones to fit her style and your budget, with shapes ranging from highly faceted square princess cut to timeless ultra-brilliant round cut diamonds and bold-hued gemstones. Then there’s diamond grading – also known as the 4Cs: cut, color, clarity and carat weight – all the components that play into the overall beauty and sparkle of a diamond and your engagement ring budget. Once you’ve chosen your stone, it’s time to find an engagement ring setting she’ll love and choose a metal – from classic yellow and white golds to ultra-luxe platinum and lustrous, lightweight palladium. We know it’s a lot to think about, so our expert Jewelry Consultants are here to teach you how to buy your engagement ring. With tens of thousands of GIA certified diamonds to choose from, our free shipping and 101-day return policy and free ring sizing, Gemvara wants to you to feel both trust and excitement as you choose your unique engagement ring. Put aside old ideas about budget. When thinking about how to buy an engagement ring, put aside old ideas about budget. Sure, anywhere from one to three months salary is a fine benchmark, but once you get an idea of the kind of ring you want – one that means something to the two of you – our completely customizable experience, with gems and metals at just about any price point, lets you create a ring that’s uniquely and pricelessly yours. Years ago, diamonds were the only option for engagement rings. Now you can use gemstones to create a unique engagement ring that’s different from the rest. Make it special: use colored gemstones alongside your diamond to incorporate birthstones or colors with meaning to her; choose a unique gemstone or diamond shape; select a setting that matches her personal style. There’s a lot to think about when creating the perfect engagement ring, but it can also be a lot of fun. When you’re learning how to buy a engagement ring, knowledge is power. Our diamonds are certified by a third party – the Gemological Institute of America (GIA) which is recognized as one of the world’s top authorities on grading diamonds – so you can feel confident in their value. Each diamond is unique like a fingerprint, as they contain a number of properties that make them special. Those properties are classified in terms of the 4Cs of diamonds factoring into the sparkle, size and price of your diamond. We have tens of thousands of diamonds to choose from, and will help you find that unique stone that works with your budget and her style, and more importantly, makes it the perfect diamond for both of you. Unlike diamonds, there is no accepted grading system for colored gemstones. But Gemvara has very high standards for its gemstones, which are all hand selected for their beauty. Our fine quality gemstones are very well cut, with lively brilliance and very good polish. Gemvara selects premium medium-toned gems in each variety so that they complement each other in styles with multiple gems. Whether you choose a diamond engagement ring or a gemstone engagement ring, feel confident in the quality and workmanship you will be receiving. It’s our duty to share a few of the things we’ve learned along the way: there are the little details, like finding her ring size and further personalizing the experience with engraving, and then there are the logistics of the ask. Who do you tell? The rule is, there is no rule! Tell as many people as you need to pull off the perfect engagement: Need help with style? Enlist her sister, mom or best friend. Is she the traditional type? Ask her father’s permission first. Need extra hands to pull off the perfect plan? Get your friends to help. When you do pop the question, make sure you have her parents and best friends on speed dial so she share the good news right away. Consider capturing the moment with pictures – we've had customers hire photographers to hide nearby and snap the perfect photo of the moment. We’ve had customers get really creative with scavenger hunts leading to the ring, and fortune cookies that read "Will you marry me?" And it’s always nice to have champagne on hand to celebrate. Most importantly: Trust that she'll say yes, no matter how you ask!